Las Vegas, NV—Applications are now open for the second Nikon Storytellers Scholarship. The program, launched in December 2017, celebrates the power of visual storytelling by supporting the education of aspiring content creators. Eligible students in the United States as well as Canada can now apply for the chance to be selected as one of 10 winners to receive a $10,000 academic scholarship. The scholarships will be used to further their development as visual storytellers and help them in their pursuit of compelling stories. 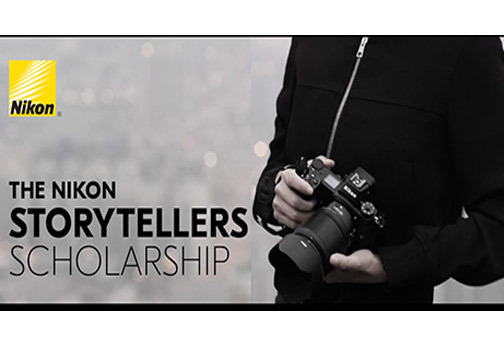 The Nikon Storytellers Scholarship received more than 1,000 submissions in its first year. It is again open to undergraduate as well as graduate students in the United States and Canada who are pursuing degrees in visual arts, fine arts, journalism, film, photography and multimedia/content creation. In addition, they must have completed their freshman year of college or the academic equivalent. Moreover, the scholarship includes two stages of submissions. The first round consists of academic and professional references. If selected, students will advance to a semifinalist round. In this round they will submit an original piece of creative work. A committee of industry professionals will evaluate the work. Building on its legacy of developing innovative optical technologies to help creators bring their vision to life in new and compelling ways, this year Nikon challenges students to showcase what Capture Tomorrow means to them. They must also demonstrate how they are pushing the creative boundaries of their craft. Ten emerging visual creators will garner a scholarship for use in the 2019–2020 school year.